Kindly hosts in Brunswick, GA turned over their Air B and B to us. The accommodation is a remodeled garage, – were we not fasting we might find the kitchen a bit crowded, but for us, this week, the accommodations are ideal. Egrets, ospreys and vultures glide overhead. Huge live oaks surround us, looming and beautiful, draped in Spanish moss. Tannins released from the oak trees seep into the nearby river, historically a source of fresh water because the tannins killed the bugs. Centuries ago, colonizers would fill huge containers with “brown” water from the river, water in which the bugs couldn’t survive, and use that water for their drinking needs throughout their voyages back to Europe. Two highlights of the day were conversations with Mark Colville and later Steve Kelly, both of whom called us from the Detention Center. Each had begun the day reading the same reflection we had earlier shared, which included a passage from the Sermon on the Mount. Choosing to “go the extra mile,” our friends who face trial bring to life the spirit of early abolitionists and the ancient call to choose life that you and your descendants might live. We decided last night that we wanted to vigil earlier, from 9 to 11 am, to avoid the hottest part of the day. We started at 8 am with some of us doing Centering Prayer outside under the huge oak trees draped with Spanish moss, – so prevalent here in Brunswick, and throughout southern, coastal Georgia. Afterwards we slathered ourselves with sunscreen, donned our hats, and packed up our cooler with water and juice. Then we grabbed our signs and banners (now with sticks fastened to them to make them easier to hold!) and hopped into the car. 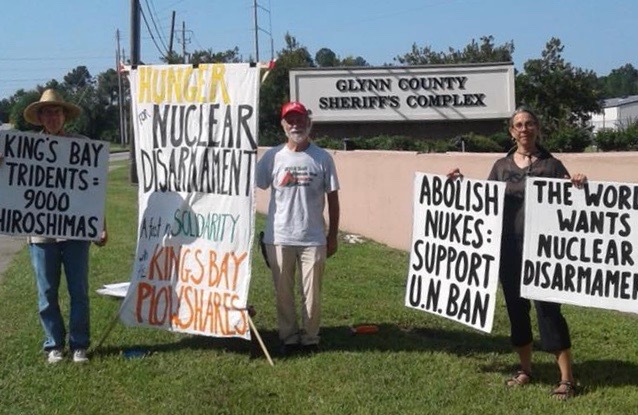 We drove the 4 ½ short miles to the Glynn County Detention Center, where Clare, Liz, Steve, and Mark are being held on federal charges stemming from the plowshares action at Kings Bay Naval Base. We set ourselves up for our two-hour vigil along route 25. The traffic along Route 25 was loud which made conversation difficult. There were periods of silence, and in the silence, I of course thought about and prayed for our friends. I also extended my thoughts and prayers to the other 400+ prisoners locked up there. Like our friends, they are somebody’s mother, daughter, sister, grandmother, wife, aunt, uncle, brother, grandfather (or soon to be, like our recently released on bail friend, Patrick! ), son, or husband. If this jail reflects the overall jail population in the U.S., 70 % of them are being held PRE-TRIAL. This means that they, like our friends, have not been convicted of a crime, only accused. How many days, weeks, even months of their lives will be stolen from them? How many of them will ever know justice from a system that oppresses particularly the poor, people of color and LGBTQ folks? At the vigil Kathy reminded me that it was Juneteenth, which commemorates the ending of slavery. Juneteenth dates to 1865 when on June 19th Union soldiers arrived in Galveston, Texas, and announced that the war had ended and that the slaves were now free, two and a half years after President Lincoln signed the Emancipation Proclamation. Juneteenth serves as a powerful reminder that freedom and justice has always been delayed for blacks. A local supporter from Brunswick, Robert, joined us at the vigil and later back at our cozy converted garage for morning prayer. Afterwards, we all trooped back outside to paint rocks that Ken had gathered at the Swannanoa River in Western North Carolina and I had gathered at Lake Superior on our family vacation last year. Celenda, a local supporter in St Marys, just south of Brunswick and the town closest to Kings Bay Naval Base, told me on one of my earlier trips to south Georgia about Painted Rocks of St Marys. This popular project grew out of The Kindness Rock Project, whose goal is “to promote random acts of kindness to unsuspecting recipients by painting and dropping inspirational rocks.” We talked about out how we could help spread the good news of the Kings Bay Plowshares by painting rocks with peace symbols and hiding them in St Marys for “unsuspecting recipients” to find. Encouraged by Steve Baggarly’s puns (“We’re off to a rocky start,” “Looks like we’ve hit rock bottom,” etc.) we spent a couple of hours painting the rocks with peace symbols and reminders to “love one another,” “end police brutality,” “disarm,” and “put away your Trident.” A neighbor across the street came over and joined us. She told us about her many concerning health issues and her new job, going door to door for A T & T. She showed us a video of her 6-year-old niece, a video that has gone viral. The child pleads for an end to the shooting, for an end to violence. After showing us the video she explained that her other niece, the little girl’s three-year old sister, had been killed in a drive-by shooting in Miami. In the Gospel reading this morning Jesus says to the disciples, “You have heard that it was said, ‘You shall love your neighbor and hate your enemy.’ But I say to you, love your enemies and pray for those who persecute you….” How can we possibly live out this Gospel in a society that has nuclear weapons on hair trigger alert aimed at our so-called enemies, a society that demonizes and imprisons people of color and poor people at unprecedented rates, a society in which a 3-year-old girl is shot and killed in her own front yard? I don’t exactly know the answer, but I think that Steve pointed me in the right direction when he said in our morning prayer that the bottom line is love. Standing on the corner in Brunswick, GA, we were such a fine sight to see. There in front of the downtown federal courthouse, we had friendly interactions with the marshalls, guards, pedestrians, and drivers-by. We handed out flyers about the Plowshares action at Kings Bay and had a few chats with local people about why we were out there. 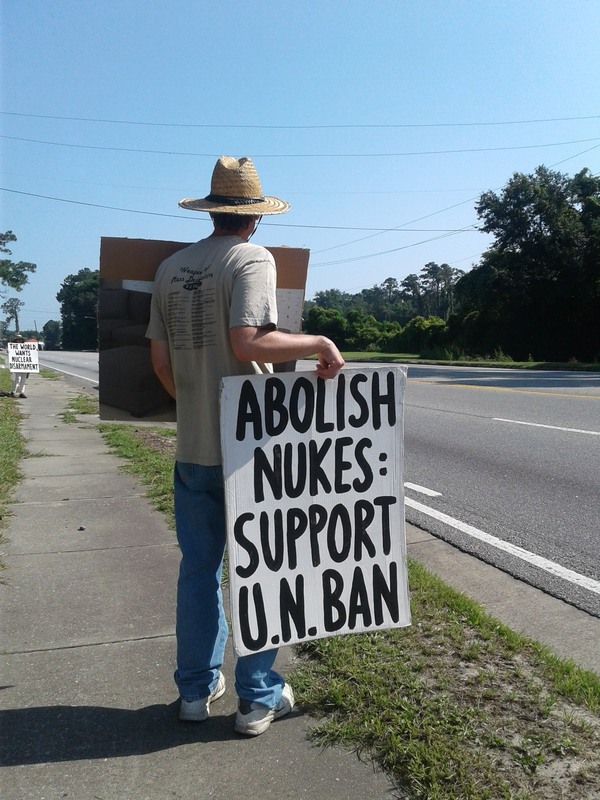 One young pre-teen said that he’d never seen a protest before and agreed with our message calling for the abolition of nuclear weapons. It was heartening. A reporter for the Brunswick News came by and interviewed us. He was a Vietnam veteran and said that he understood the futility of war. But did he understand the threat of nuclear weapons? He asked why we came from such distances to fast and stand on corners – we talked about nuclear annihilation and the call of conscience. He didn’t seem to know the sheer explosive power of the Tridents (equal to 9,000 Hiroshimas), and gave the company line that the bombs in Hiroshima and Nagasaki ended the war and actually saved American lives. We responded that the bomb was unnecessary because the Japanese had already sought to surrender, but we dropped the bombsanyway, as a warning to the Soviet Union. He also posed the question about us needing a strong military for defense and deterrence. We replied that our military was primarily offensive, with our military operating in over 70% of the countries in the world, conducting bombings and proxy wars and covert actions wherever it likes. We didn’t get to a discussion about mutually assured destruction. Beth was able to visit with Clare this morning, who expressed gratitude about the growing community of support. But Steve and I were unable to meet with Mark because, even though he had entered us into his visitor list in the online system in the jail, the system did not yet have us listed. He is only allowed visits on Wednesdays and Sundays, so we won’t get another chance to see him while we’re here. “Seeing” an inmate at the jail means sitting in a carrel outside the secure area and using a computer screen to do a kind of skype interaction. It’s called a “no contact” visit. Cold, but better than nothing. But we weren’t allowed to have even that. The prison system works at keeping people apart. In the evening, we spent a couple of hours with Bill Quigley, who is serving as Liz’s attorney and was in town to visit the four who are still in jail and to be with us supporters. Sitting in a circle, fourteen of us shared ideas and experiences that ranged from the legal status of the case involving our friends, to concerns about how to engage others in this struggle, to a gamut of related concerns like guns in our society and environmental degradation. Bill reminded us that we might be the choir, but every choir needs practice. Our practice this evening included a couple of thought experiments. Like thinking about all the things that were legal one hundred years ago that we now know were not just. What will our descendents think years from now about our tolerance of nuclear weapons on this planet and imprisonment of those trying to get rid of them? Like considering that if our seven Plowshares friends had done this action in North Korea or Iran, the U.S. Congress would probably give them a medal. He also reminded us that our job as the choir is not to convert others who are unwilling to see, but to inform and energize those who are open but maybe uncertain. And to join with other choirs. And you can’t stop the song that we sing. Day four of our fast began with Liz McAlister calling from nearby Glynn County Jail. Over speaker phone her familiar voice assured us that she is shoring up all right. She had been returned to a previous cellblock because pregnant women needed the bottom bunks in her current block. She said she doesn’t encourage people to come visit her because visiting means 15 minutes over a screen and she doesn’t want people to invest their time like that. At 78, she is a stalwart and kind-hearted veteran of many such campaigns. For today’s vigil we were back at the Trident sub base in St. Mary’s. The four of us set up at three different places on the intersection to try to catch the eye of the most traffic. I faced traffic coming off the base just on the public property side of the blue line stretching across the street separating public from Naval Base property. After an hour and a half, a young Marine in brown camouflage walked up and planted himself in front of me, on the other side of the blue line, and waved a small American flag. I had received no perceptible reaction from the several hundred cars leaving the base since my arrival, but his presence led to enthusiastic cheers from the first 10 cars that went by. But it was short-lived. I struck up a conversation with him and just as he was telling me that the ballistic missile submarines were what allowed us to live as free people, Navy Police called him over to a nearby parking lot. After an extended discussion they took his cap off, ran their hands through his hair, emptied his pockets, patted him down, cuffed his hands behind his back, and put him into the back of their car. The police wouldn’t say why he was being detained. Our best guess is that orders had gone out forbidding any personnel from engaging us and that he had disobeyed. While others distributed the remainder of rocks in old town St. Mary’s, I went to the Submarine Museum that sits on the main drag. On the second floor the ex-submariner who runs the place was giving a talk to a dozen or so people including young sailors from the base. I looked around at the Trident and Poseidon ballistic missile submarine exhibits and then listened as he began to describe how the Trident D-5 missiles work. Among other things he explained that the missile always knows its latitude and longitude, as well as the month, day, hour, minute, and second of the year, because its guidance system knows how the stars are arrayed at any given moment and uses them to find its target. As a missile arcs across the globe it can release its up to eight warheads at eight different targets. He said that once the red launch button was pushed (he had one from a retired Poseidon in a glass case) it would take only fifteen minutes before some small country would be destroyed. Throughout the day Kathy Kelly has been planning for a walk, beginning September 2, from General Dynamics’ Savannah headquarters to Naval Submarine Base King’s Bay. Voices for Creative Nonviolence is looking for people interested in helping to plan and/or take part in the ten-day event. 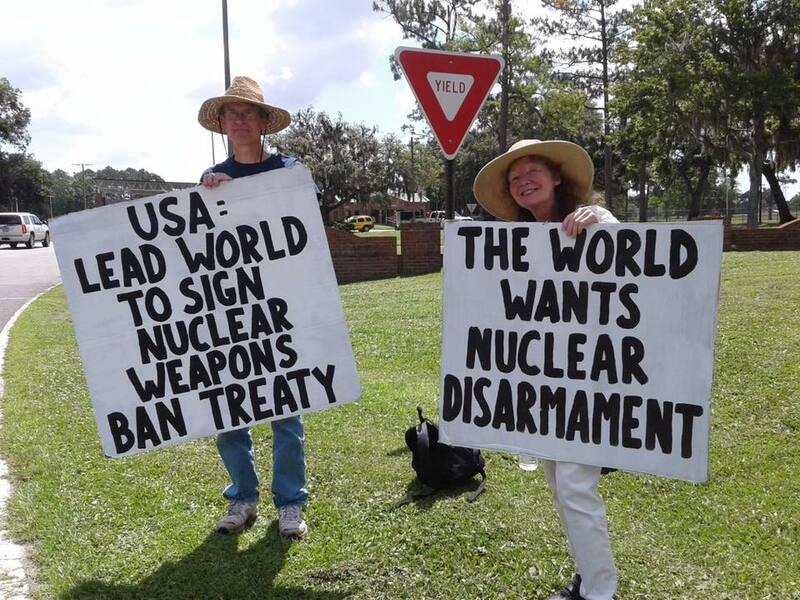 During the morning vigil I held a sign proclaiming “The possession of nuclear weapons is to be condemned—Pope Francis.” It is appropriate that the first US Plowshares action since the drafting of the Treaty on the Prohibition of Nuclear Weapons is made up entirely of Catholics. The very first day, last September 20, that the Treaty was open for signing and ratification only three UN members did both—Guyana, Thailand, and the Holy See. Pope Francis’ signing of the Treaty marked a new day in church teaching on nuclear weapons. Until then, the church had allowed for deterrence as a step along the way to global nuclear disarmament. But as the Treaty forbids partners from the possession, development, stockpiling, use, or threat of use of nuclear weapons, or any assistance to nuclear powers in such endeavors, he closed the door on the church allowing for even the existence of nukes and declared the deterrence era, over. Finally, the church has aligned itself with its founder, Jesus, who taught love for the enemy and choosing the cross over the sword. 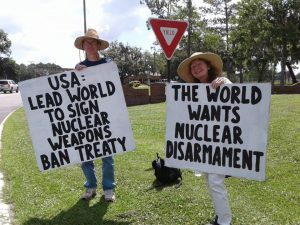 Finally, the church has declared that the time for nuclear disarmament is NOW. This is the very message that the King’s Bay Plowshares brought onto the Trident base in April, into the very belly of the Beast. 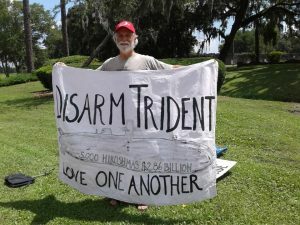 When the Kings Bay Plowshares decided to smash idols and beat swords into Plowshares at the Kings Bay Naval base in St. Marys, Georgia, we assumed there would be lots of people in that community and surrounding towns and cities who were appalled to live in the shadow of the most insidious weapons system ever built by humans — Trident submarines armed with D-5 missiles. 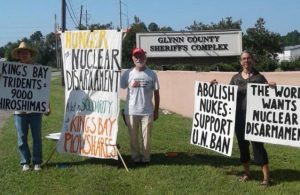 To our surprise the folks in south Georgia and north Florida are actually filled with pride because this weapons system of mass destruction is part of the landscape where they live. They are essentially oblivious to the fact their economy and livelihoods are predicated on a promise to end life as we know it on planet earth. In fact, the Trident system includes enough explosive power to kill almost twice the earth’s population. And that’s just one of the Pentagon’s vast array of nuclear weapons systems. It has been surprising to me that few locals share our view that planning the end of the world (that’s what Trident represents) is a bad idea. 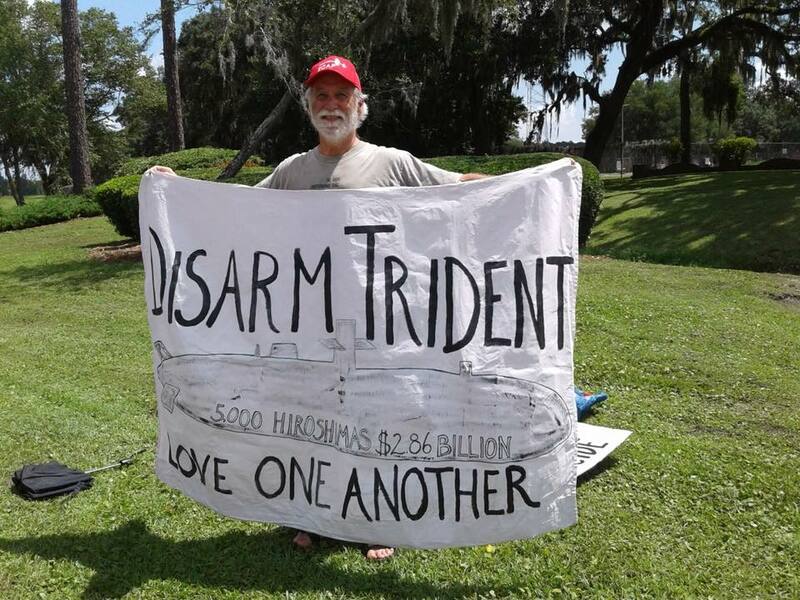 Perhaps that’s why it was a good idea for the seven of us Catholic Christians to come to this southern beach community to offer an alternate view of Trident and the threat it poses to humanity and all creation. My hope is our action might make people reflect on the insanity of Trident. 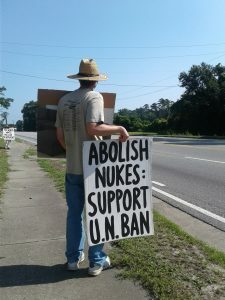 Today was the fifth and final day of our “Hunger for Nuclear Disarmament” fast. The six of us — Ken Jones of Asheville, North Carolina; Kathy Kelly of Chicago; Beth Brockman of Durham, North Carolina; Steve Baggarly of Norfolk, Virginia; Robert Randall who lives near the Trident base and me — have used our time together to pray, plan and build community for the work ahead. We are grateful for the hospitality provided by Terry and Chris Noyes and Fr. Bob Cushing, pastor of St. Joseph’s Catholic Church in Waycross, Georgia. We are also grateful for the gracious hospitality and support of Celenda and Michael Perry of St. Marys. Each day here for the fast included a public witness, three times at the Kings Bay naval base, once at the Glynn County jail, where four of my co-defendants are still being incarcerated and once at the Brunswick federal building where our trial will be held. 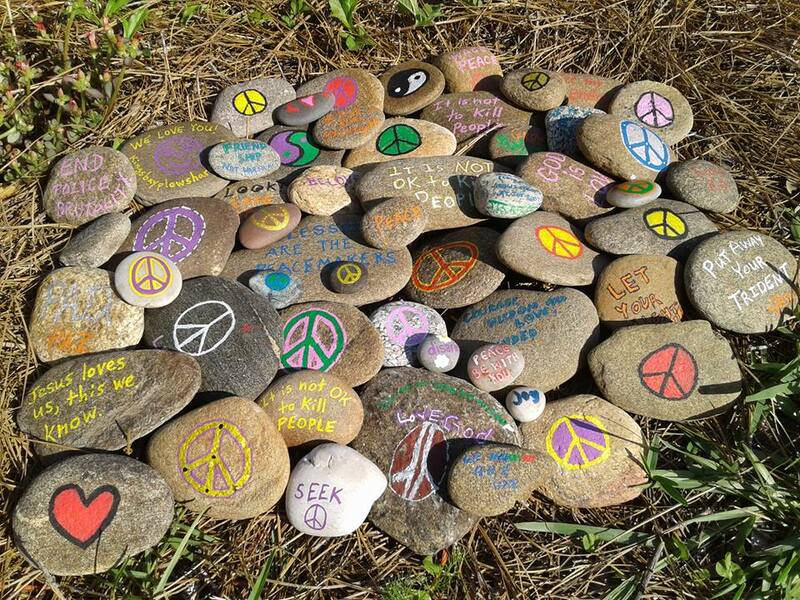 We also painted “peace rocks” and hid them in St. Marys for people to find. Because I am under “house arrest” I chose not to join the daily witnesses. I have done other means of support, and met with three of our team’s lawyers. On Wednesday night we had a gathering of 14 of us led by lawyers, Bill Quigley, of the Loyola University Law School in New Orleans, and Jason Clark, a local Brunswick/Glynn County defense lawyer. We held a round-table discussion about our case at the Unitarian Universalists of Coastal Georgia fellowship, which gratefully hosted us. Our numbers may be few in this work to save the world from nuclear destruction, but our spirits are strong, our hearts are steadfast and love is our measure. Like all of you reading this reflection, I dream of a better, brighter, disarmed world in our future, a world where our children and grandchildren will not have to face the prospect of nuclear war. First we disarm our hearts and then we disarm our weapons, and finally, let’s disarm our world. 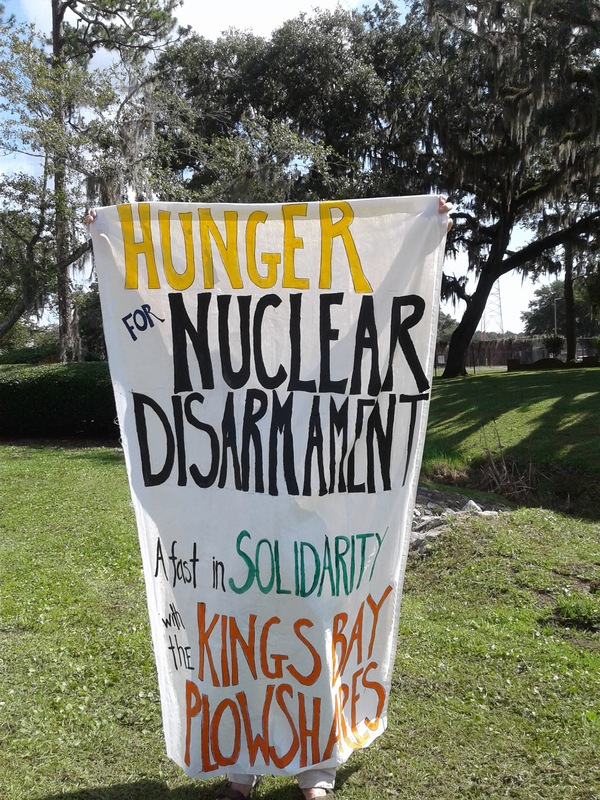 Kathy Kelly, Steve Baggarly, Ken Jones and Beth Brockman have begun the “Hunger for Nuclear Disarmament” fast at the Naval Submarine Base Kings Bay, at the Stimson Gate, in Kings Bay, GA, seeking abolition of all nuclear weapons and justice for fellow activists who await trial for attempting to convert “swords into plowshares” through a plowshares action at the base. Kings Bay is home port to six nuclear armed Trident ballistic missile submarines with the combined explosive power of over 9000 Hiroshima bombs. On June 19th the fasters will hold a public presence in front of the Glynn County Detention Center, 100 Sulphur Springs Road, in Brunswick, GA, where four of the seven Plowshares activists are being held. They will be at the U.S. District Court at 801 Gloucester Street in Brunswick, GA on June 20th and 21st, and they will finish on June 22nd with a peaceful presence at the Kings Bay sub base. For more information, please call Steve Baggarly at 757-469-6239. The public is invited to join them.